I'm so excited to be participating in Papertrey Ink's Stamp-a-faire 2017! Join us for a weekend full of inspiring projects, video tutorials, challenges, and prizes! It's all online, it's all free of charge, and it's all crafty!! It actually turned out to be pretty fun and I also decided to make my own embellishments. 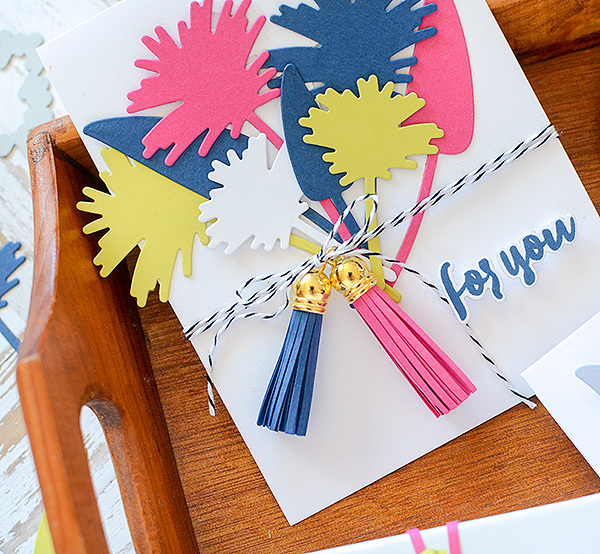 So I've taken some of my favorite gift toppers--tassels, bows, and confetti envelopes--that I normally make out of any material other than paper, and created them using cardstock. I've also got a little paper-dyeing going on, too, which offers a textural look. After I made the embellishments, I wanted to show you a few examples for incorporating them into your projects, so also in the video, I'm sharing 2 gifts. 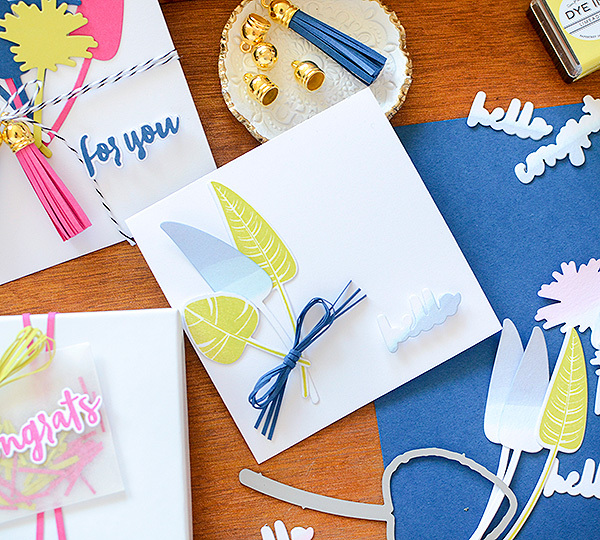 After all of that, the video was getting fairly long, and with Papertrey sharing 20+ projects and challenges throughout the entire weekend, I saved 2 cards to share exclusively on my blog. 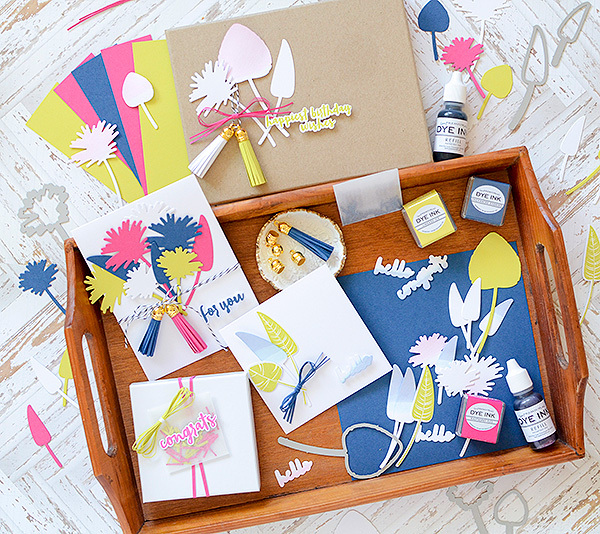 The first is a card that features dyed shapes and a paper strip bow. 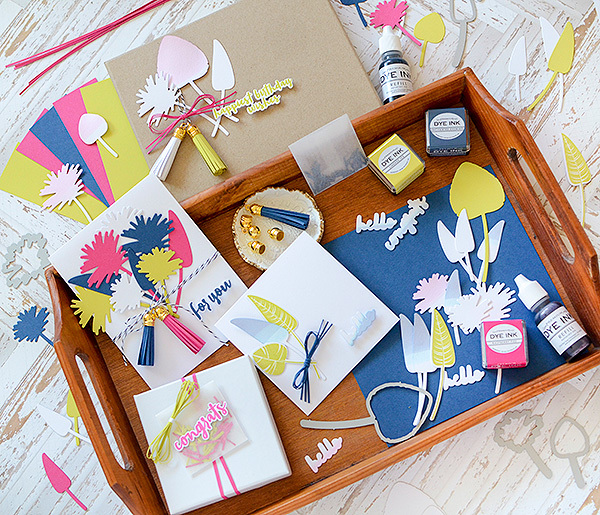 I've provided written instructions for creating each embellishment, but you'll definitely want to check out my video on Nichole's blog for the in-person tutorials of the embellishments. 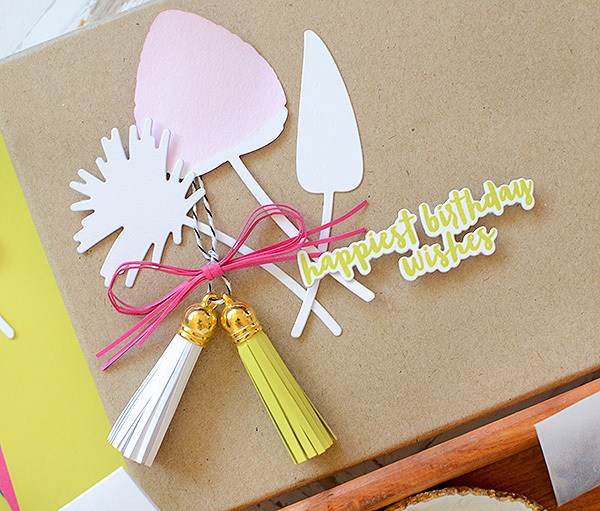 The other die cut leaves on this card have been stamped with coordinating Tropics stamps and Limeade Ice ink. Then I simply adhered each element to the card with foam or glue dots. It's very simple but still offers lots of depth and dimension. 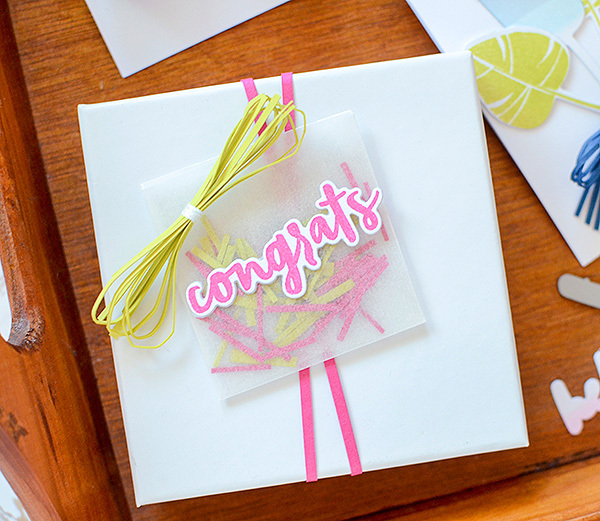 The second card features many Tropics leaf die cuts again, this time simply cut from PTI cardstock in Limeade Ice, Enchanted Evening, Raspberry Fizz, and White. The handmade embellishments this time are the fringe tassels. While I almost always use tassels somewhere on my projects these days, they are normally made from skeins of embroidery floss. 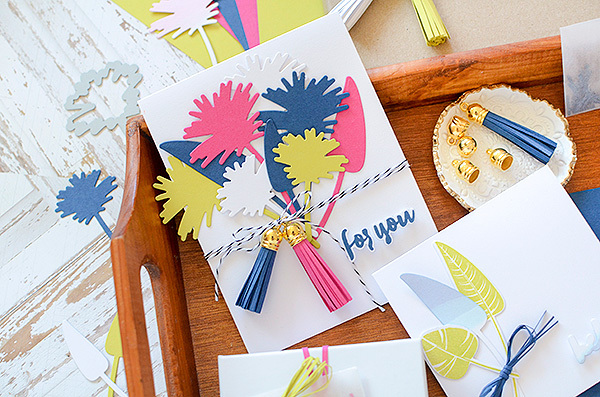 But I love that you can simply make these with scissors and cardstock and a tassel cap. Refer to the video for the "live" tutorial, or follow the instructions below to create your own. 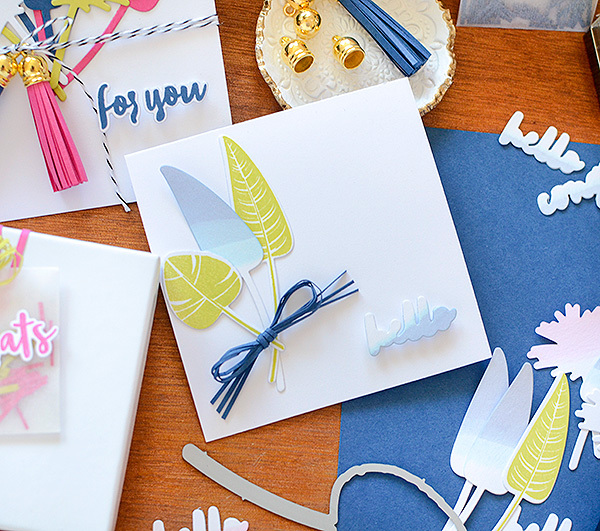 I created a bouquet with the die cut leaves, adhering them to the card base. 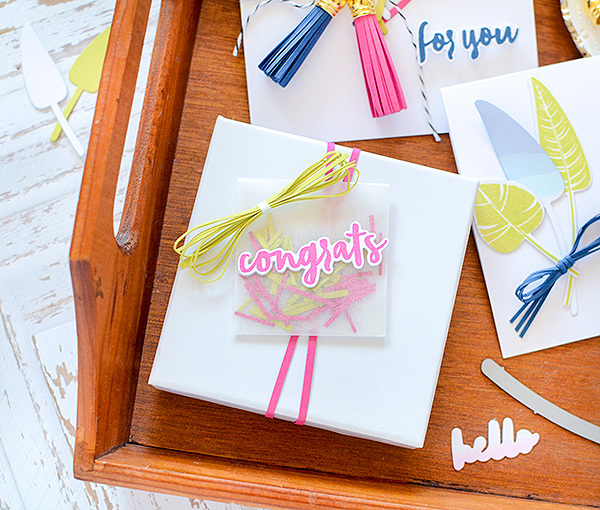 I also die cut 'for you' from the Tropics sentiments set, and stamped the coordinating words in Enchanted Evening ink. They are attached to the card with foam dots. To secure the tassels, I used black baker's twine, wrapping it around the card front twice, then tying off the tassels with a bow. Quick, easy, handmade--you can't beat that, can you? 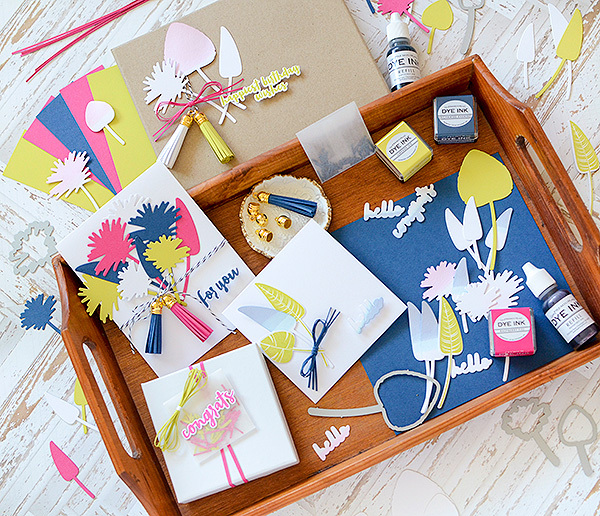 Along with my post and projects, there are so many other amazing designers taking part in Stamp-a-faire this weekend. You'll see some favorite PTI team members, as well as some extra special guests that you won't want to miss! I'll be hanging out in the PTI SAF forum, as well, for a little while, probably around 5:30/6:00pm EST today, so hopefully I'll catch some of you there. 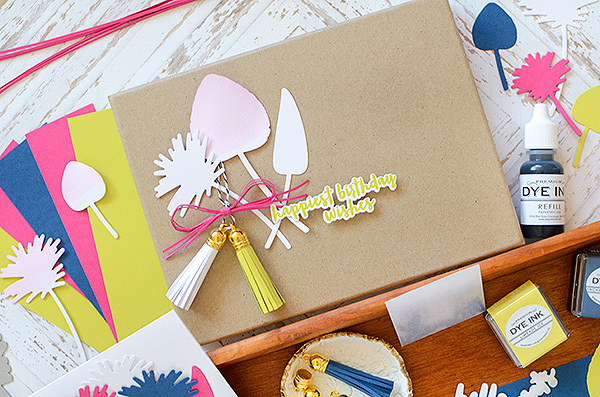 Enjoy the weekend and get crafty! !